If you are visiting the Emirates Riverside Stadium anytime soon, please let us know if you see our new crowd facing sign. If you’re not sitting near the sign then you’ll probably catch us in one of the match programmes with a full page advertisement. We were approached by the club to support them in this way and decided to use these two platforms to recruit more Foster Carers as we expand our service. Emirates Riverside is the home of Durham County Cricket Club (Durham CCC) and has hosted a number of world-class sporting and music events over the years. The iconic complex, which resides under the gaze of Lumley Castle, includes a modern Media and Education Centre and excellent eating & drinking options so it provides a perfect audience for the Acorns. 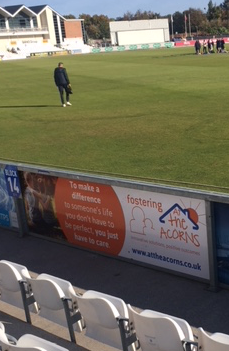 “This partnership also enables us to use the venue for our Looked After Children, taking them along to some of the events, so that’s a win-win for us” said Fiona Kingston, Registered Fostering Manager at the Acorns. “It’s not just a cricket venue, there is so much going on. There are a number of different events across the year, which offer the perfect audience for us. Indeed we were keen to get the new sign erected before the former stars of the smash hit musical Mamma Mia took to the stage to perform ABBA’s sensational back catalogue. This event took place at the end of September right when we were organising everything, so we were really pleased we managed to get the sign up in time!” added Fiona. 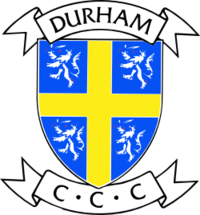 If you’d like to get a flavour for some of the varied events happening in the run up to Christmas just visit the Durham CCC website as they are all on there. Maybe we’ll see you there for Jack and the Beanstalk, it’s on exclusively for one day on the main stage on Sunday 23rd December. If you go, don’t forget to let us know if you do see our new sign! And if you’d like to join our expanding Fostering team then get in touch.